Getting ready for the First Submission? Click Here to View the Getting Started Guide for a Jumpstart! 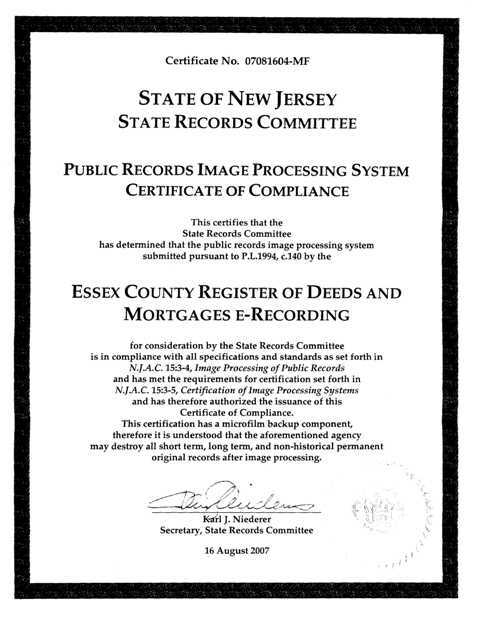 This web-site is enabled to support Essex County for recording of all documents regarding real property with Essex County Register of Deeds & Mortgages. All you need is a computer and an internet connection. The ultimate goal is to allow total electronic recording of real property. Level I allows the submitter to create an electronic cover page (Document Summary Sheet) which is then attached to the original document and submitted for recording. 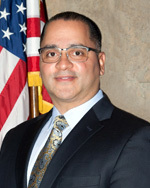 After the document is received by the County Clerk's office, recording and indexing take place almost immediately and the recording information is automatically available here on this site. The documents are then scanned and verified and returned to the sender within days. Level II will include a scanned image of the document, supplied by the sender, along with the Document Summary Sheet. Recording & indexing will take place as usual and the recorded image is returned to sender with all recording information electronically stamped on it. Again all information can be tracked on this web-site. As we continue to progress, Level III will be true electronic recordation for discharge of mortgages and certain other documents. Our goal is to provide the best possible service to the people of New Jersey and to make the recording process as timely and efficient as possible. Copyright © Sunrise Systems, Inc. 2003-2019. All rights reserved.